Thanks to /u/Vynidaris for this dram. For 140 years, Old Forester has been making bourbon. 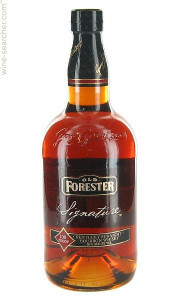 The current incarnation of Old Forester Bottled in Bond, or the closest thing to it, is Old Forester Signature. It’s no longer Bottled in Bond, however it is 100 proof, and from hand selected barrels. I guess it was hard to keep it bottled in bond, due to the requirements. What if the barrels int he specific warehouse aren’t good enough? What if you want them from a different one? I could see that. I’ve had the original BiB (see below), and liked it alright enough. Maybe things have changed in the last 30 years.